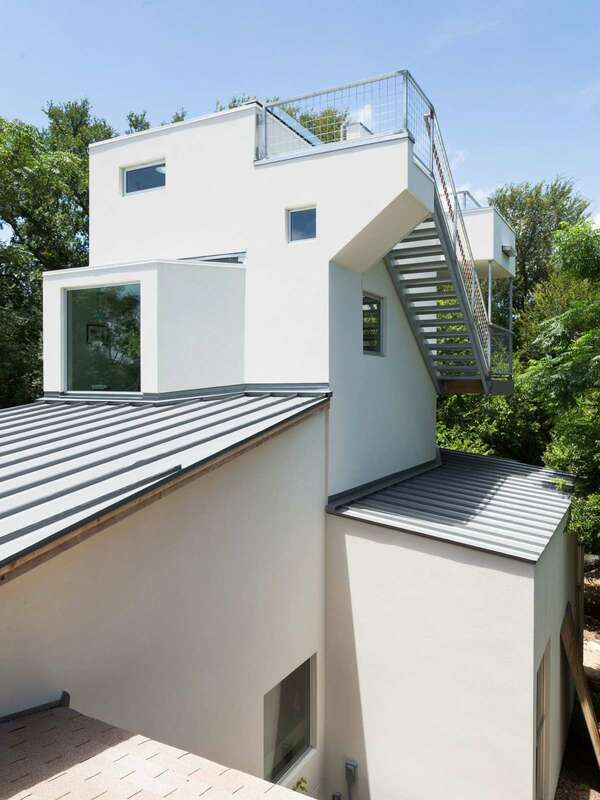 For architecture and design lovers, this weekend's AIA Austin Homes Tour is a can't-miss event. 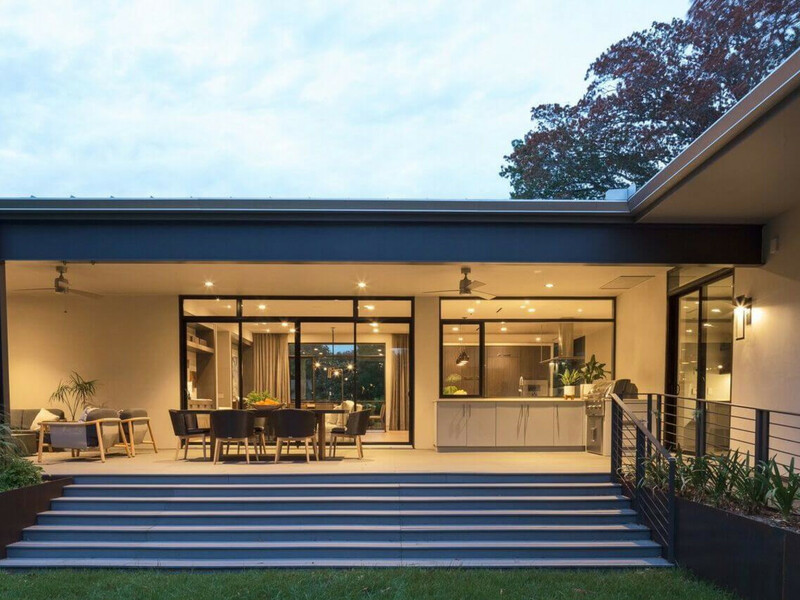 Showcasing 12 stunning homes, the self-guided tour runs October 15-16 and gives participants the opportunity to see work from the city’s most sought-after architectural firms. 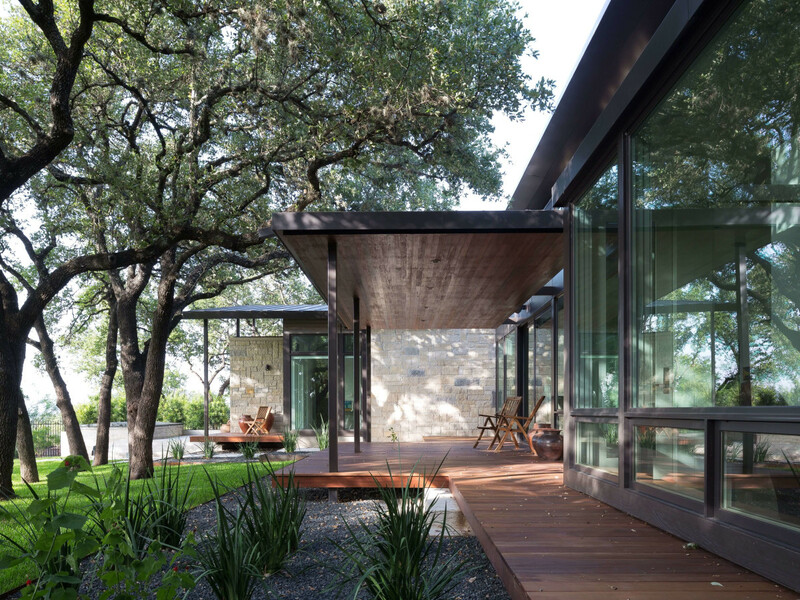 The AIA Austin Homes Tour is celebrating its 30th anniversary with a diverse collection of projects representing a range of architectural styles. 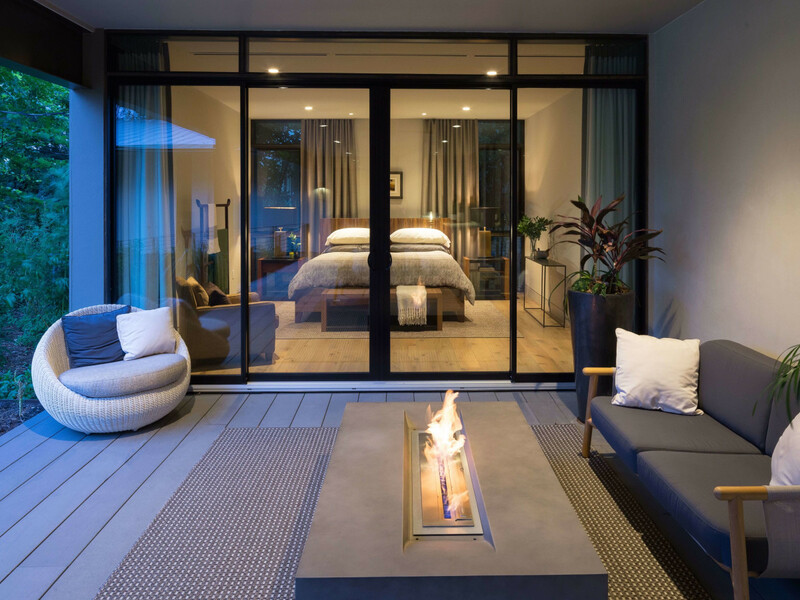 Attendees can look forward to everything from a reinterpreted modern farmhouse to an updated midcentury gem to a show-stopping stunner complete with sweeping vistas. The tour runs from 10 am to 6 pm Saturday and Sunday. Wristbands can be purchased in advance for $35 online. Wristbands are available during the tour for $40 and can be purchased at featured homes or retail locations. Entrance to individual homes is $10 (cash only) and can be purchased onsite. This property features two separate buildings: a main house and a guest house. 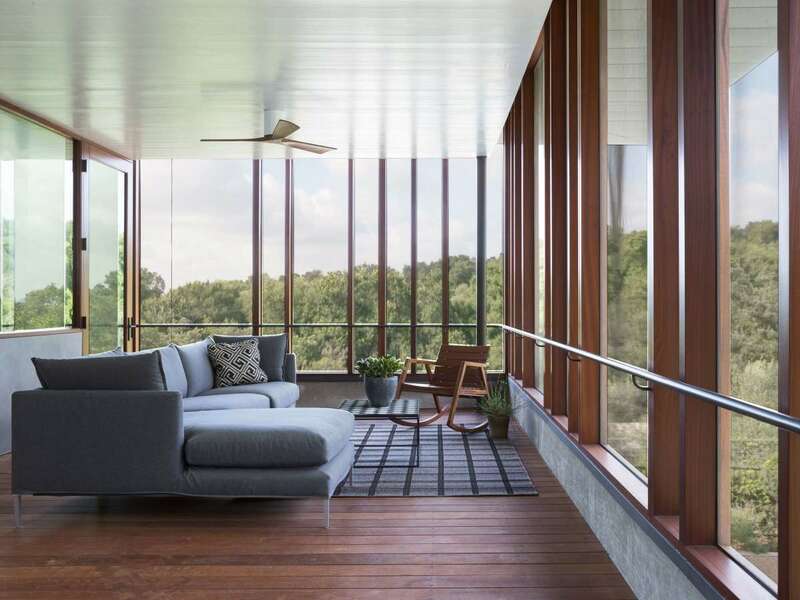 The living areas features panoramic views and lots of natural light. 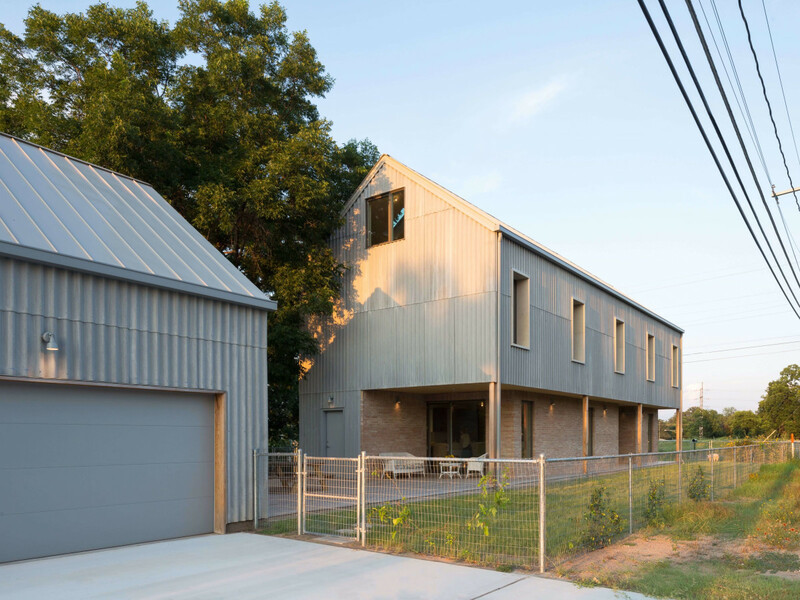 Also known as the "Elephant House," the main inspiration for this house was corrugated fiber cement panels, a material often used in European construction. It looks and feels similar to an elephant's hide. 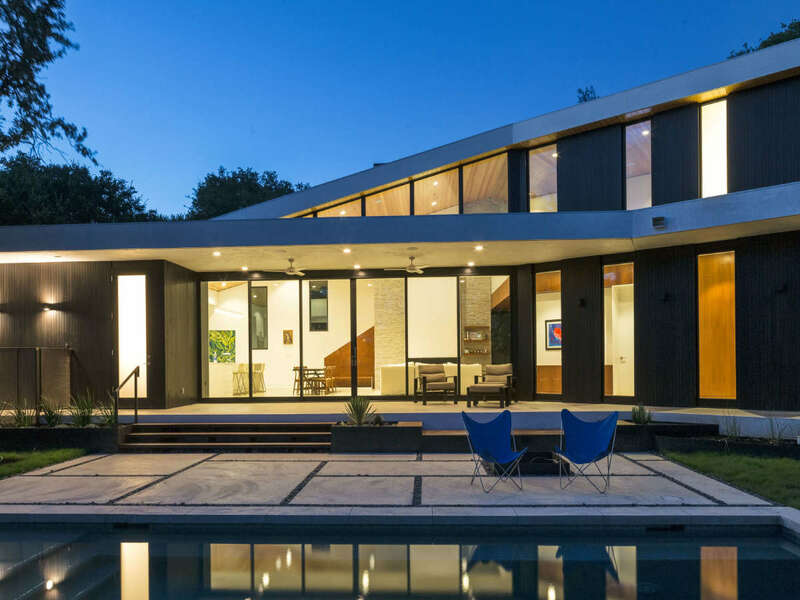 Says the architect, "The form of the house is simple and monolithic." 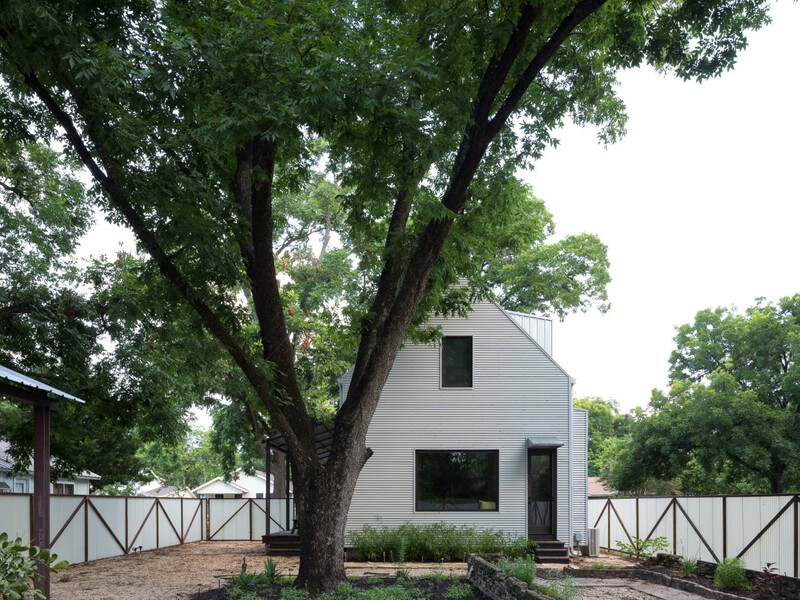 Located in a lakeside neighborhood of Old West Austin, this home is one of the last original stone cottages in the area. 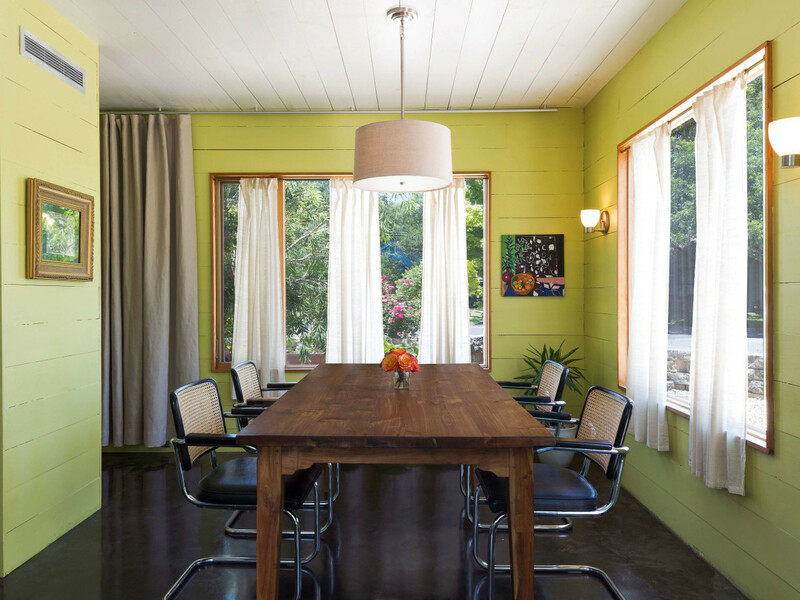 The architects worked to maintain the original charm of the existing cottage while creating a modern aesthetic. 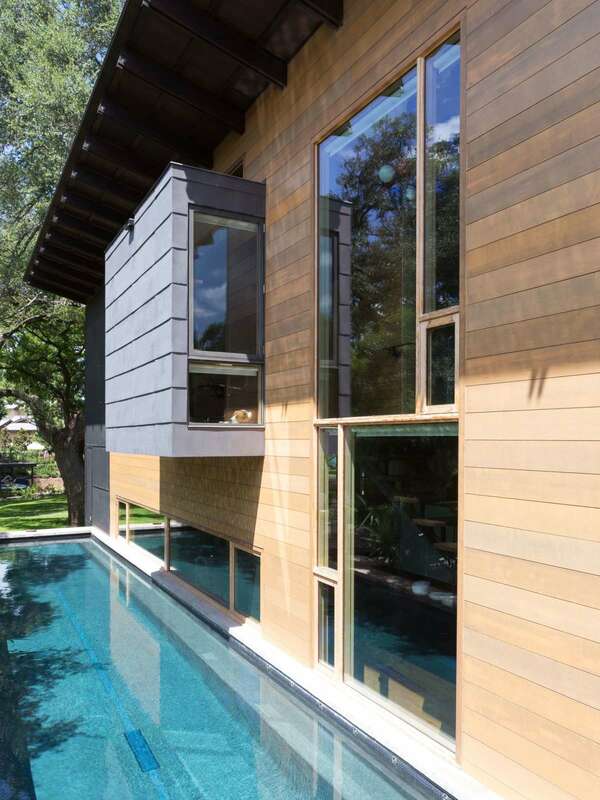 The two-story east wing of the property houses a kitchen, living, and dining spaces on the first floor, all which overlook the 75-foot lap pool. 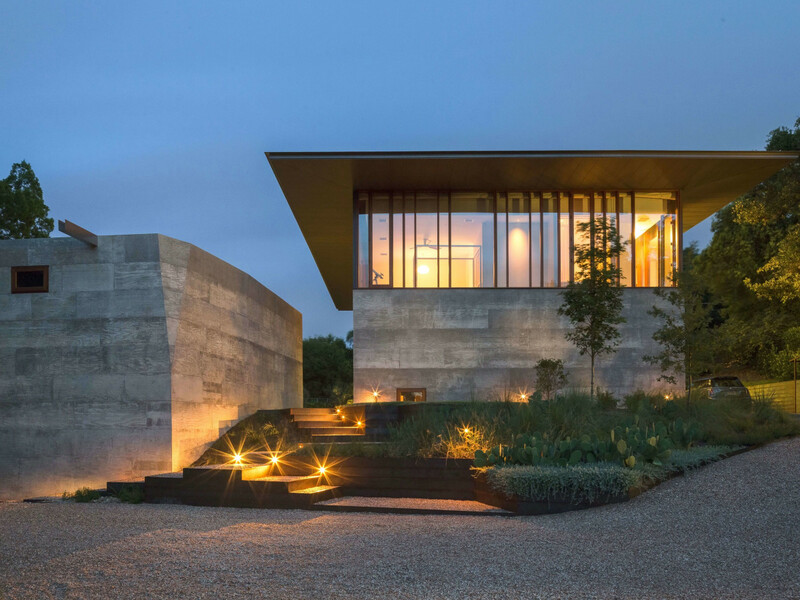 Situated on Lake Austin, the property's owners requested the home have outdoor living space, maximize views of the water, facilitate Ironman training, and provide home offices. 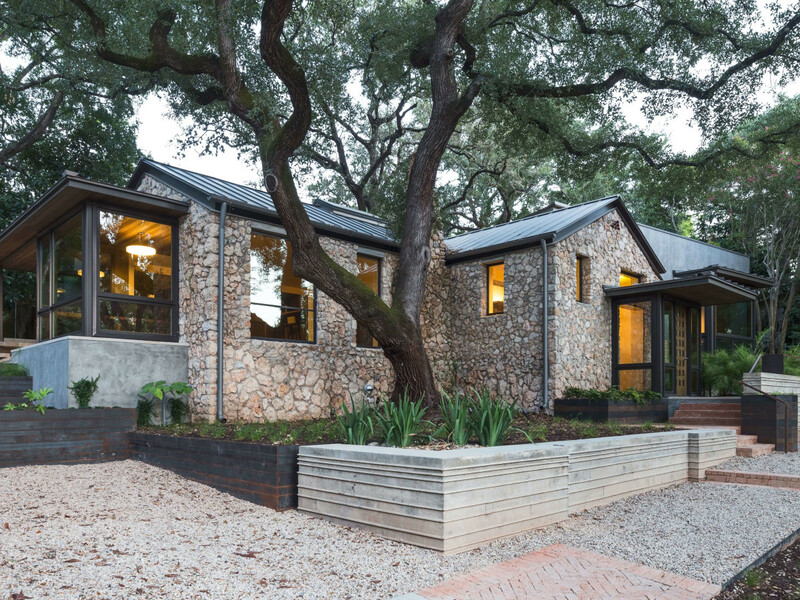 This house was built on a property overlooking the Pennybacker Bridge and Lake Austin. The clients were former University of Texas students who chose to move back to Austin from Houston to enjoy their retirement. This three-bedroom, four-and-a-half- bath new construction features sweeping vistas of the Barton Creek Greenbelt. 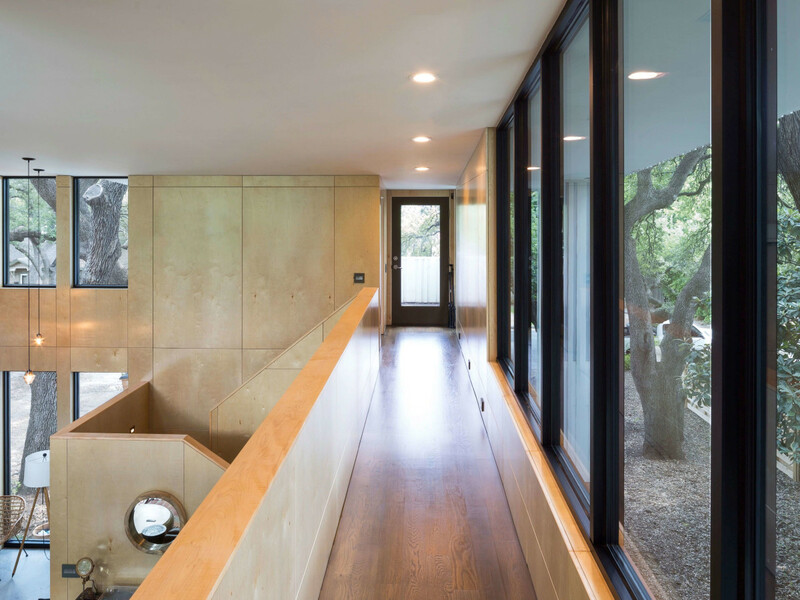 Known as the "Barton House," Baldridge Architects wanted to ensure that the interiors paid homage to the structure's natural setting. 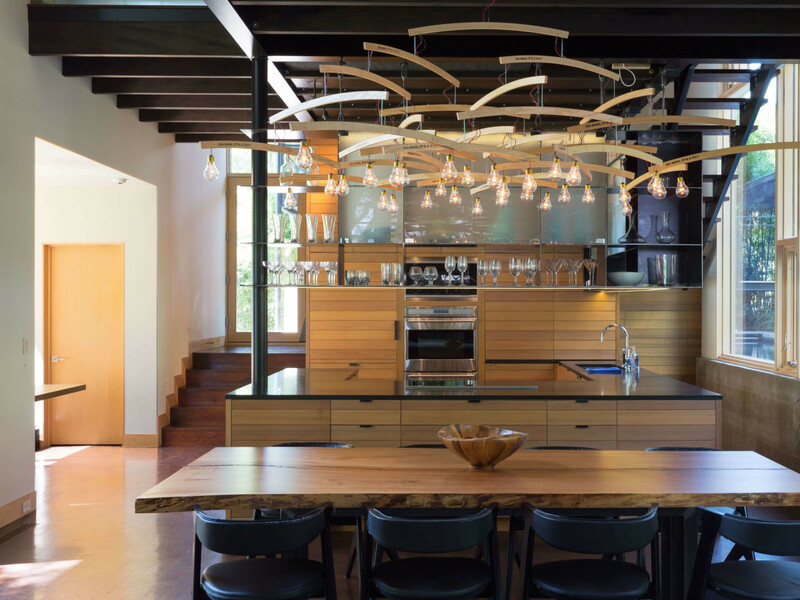 The architect created floating wood terraces in order to accommodate low branches around the property. 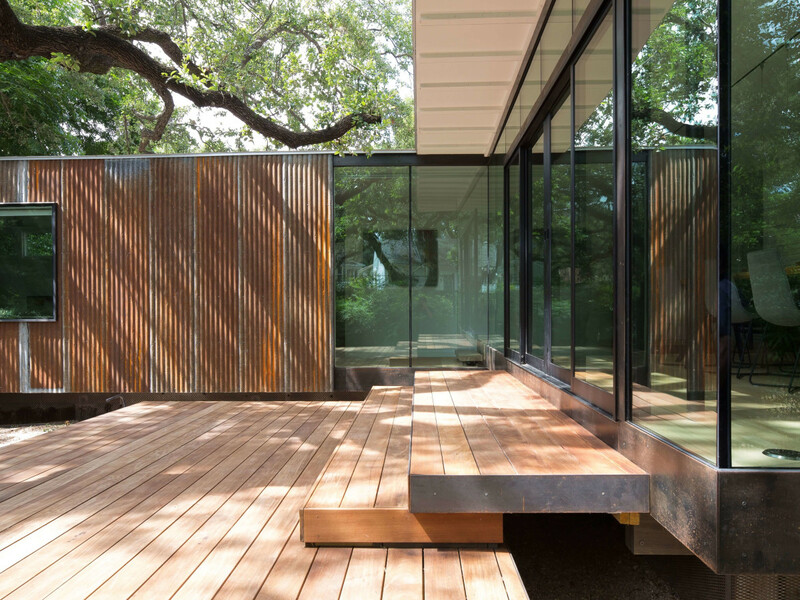 The home combines elements such as reused galvanized metal and glass to seamlessly blend interiors and exteriors. This newly constructed, 1,450-square-foot home features two bedrooms and two bathrooms. 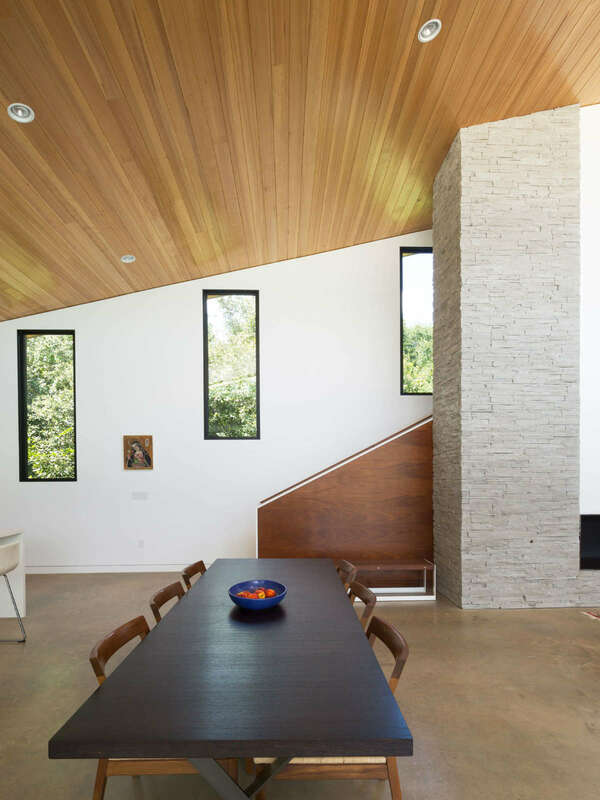 On the unique design, the architect says, "The client’s directive for durability and simplicity dovetailed nicely into our fixation with Dr. Joe Lstiburek’s concept of The Perfect Wall (also called The 500 Year Wall). This physics-based building science concept pushes the air, vapor, and thermal control layers to the outside of the structure, eliminating the need for insulation in wall and roof cavities and allowing the structure to be expressed." 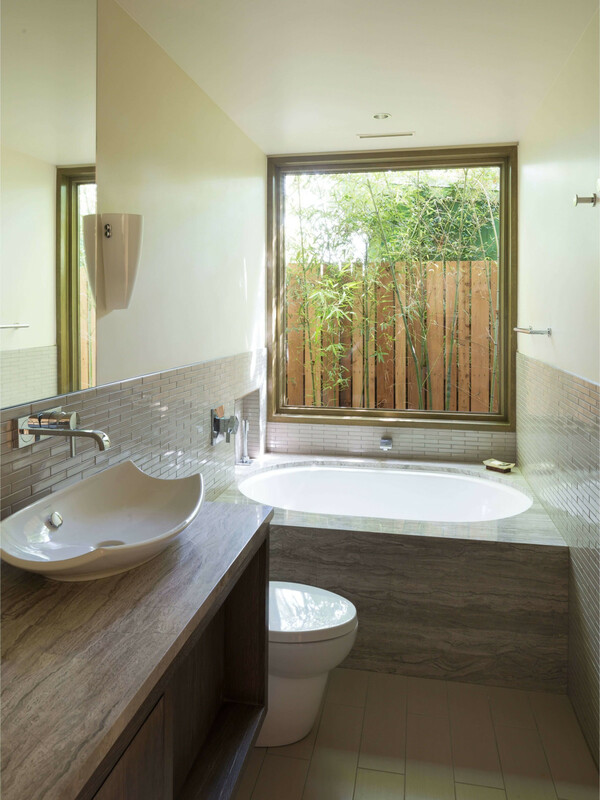 One of the home's two bathrooms. 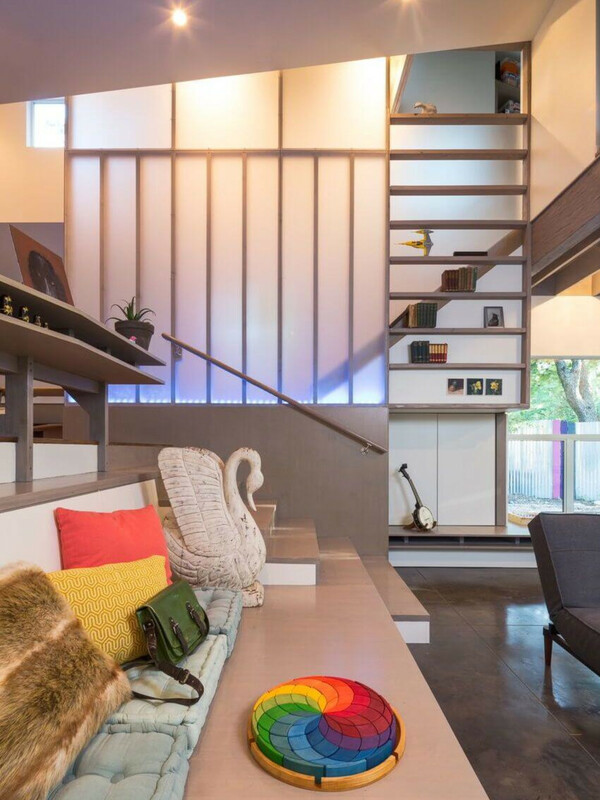 This husband-wife duo designed, built, and live in this 1,090-square-foot abode. This unique project called for a series of modern towers to be built atop an already existing 1950s ranch home. 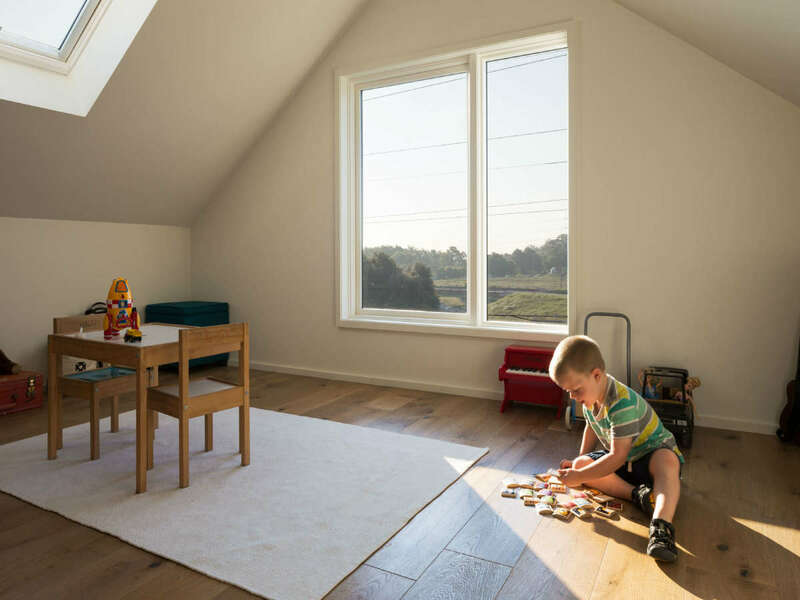 In addition to panoramic views from the tower, the family asked for a series of "shared family spaces" to be included in the design. This three-bedroom, three-bath new construction was built to maximize breezes and shade. 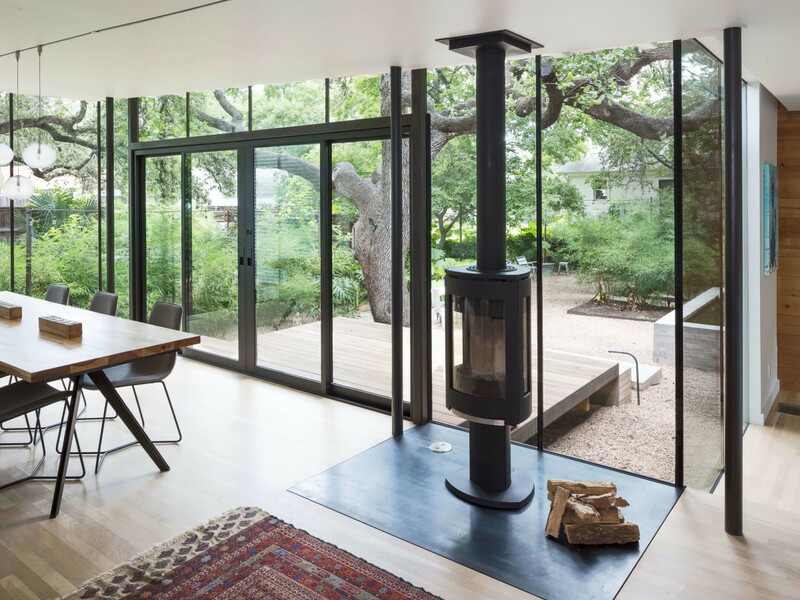 It was important for the structure to blend indoor and outdoor spaces. 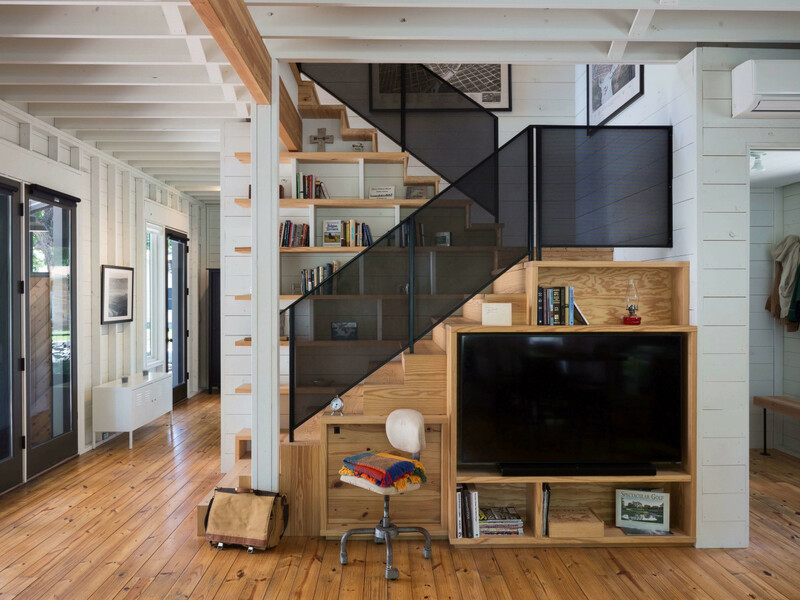 Not only was it aesthetically pleasing, it minimized the overall footprint of the home. 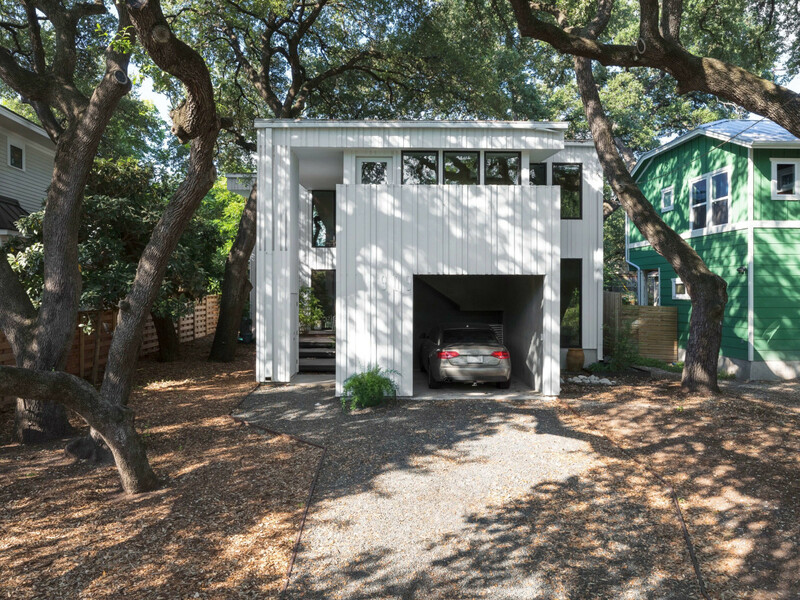 The architects originally thought this lot to be "unbuildable," due to its small size and the enormous Live Oak trees on the property. 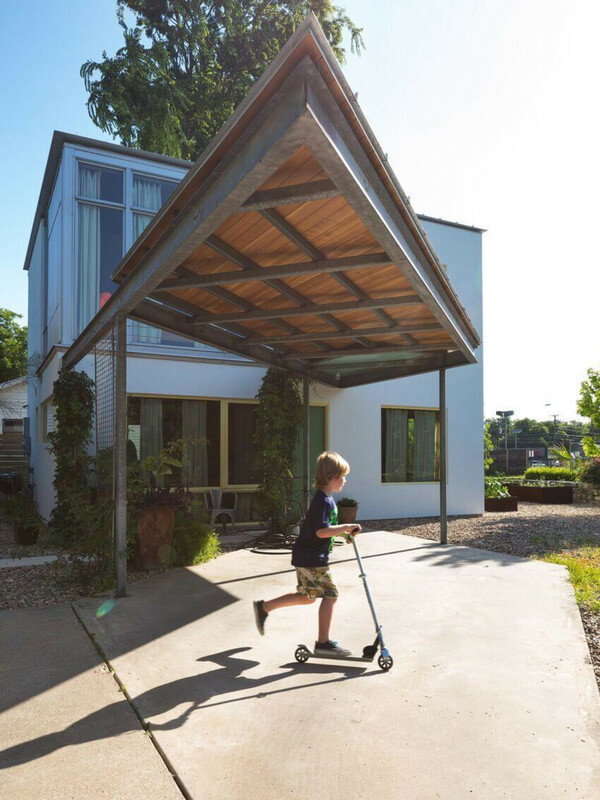 Instead, Webber + Studio created a barbell-shaped design to accommodate the family of four. 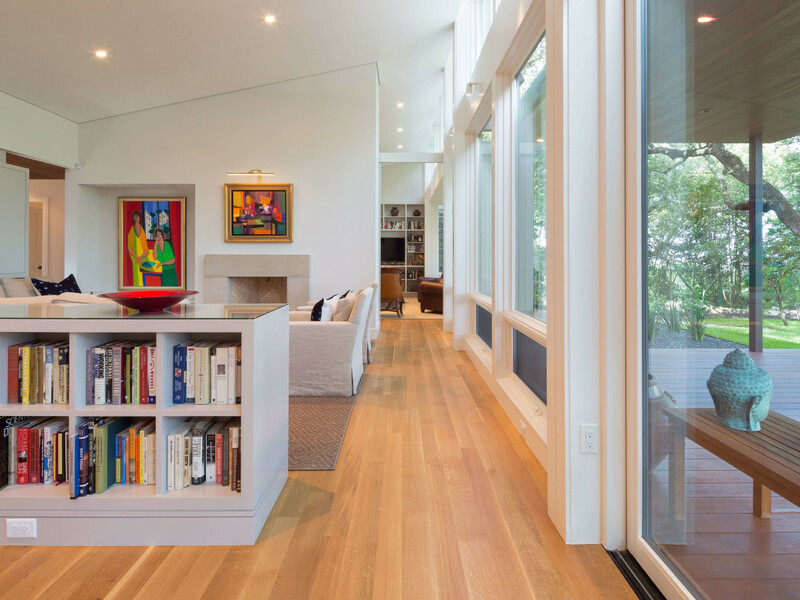 Says the architect of the unique interiors, "The house reflects the personalities of the pair of owners. 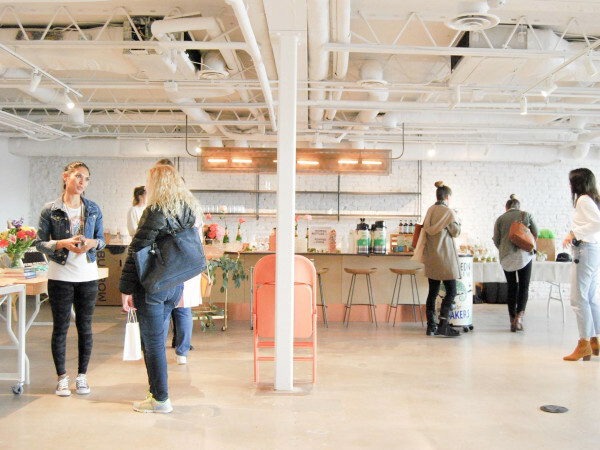 Plywood interior wall surfaces and stained concrete floors are warm and relaxed, reflecting her hard-working earthiness in contrast with his tech-y entrepreneurialism, reflected in the scrappy but resourceful ‘bar-code’ exterior siding pattern."